Rite Aid Circular November 02 - November 08, 2014. Tide Laundry Detergent Sale! 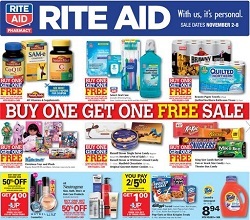 Rite Aid Circular November 02 – November 08, 2014. Tide Laundry Detergent Sale! – 2 for $2 Single Serve Cookie Tins; 50% off All Holiday Giftware; and more.